Standard Xchange heat exchangers are part of a cool new technology that turns waste products and cheap feedstock into homemade ethanol fuel for cars. 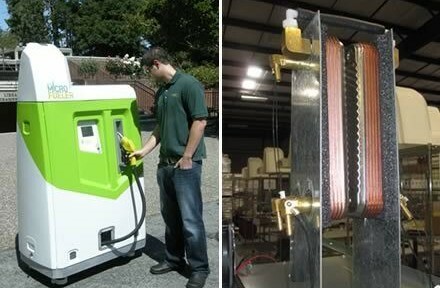 The MicroFueler (left) lets homeowners and small businesses turn feedstock like cheap sugar into clean-burning ethanol fuel, using Standard Xchange heat exchangers (right). The MicroFueler from E-Fuel looks like a typical gas station pump — without the gas or the station. This pioneering pump turns feedstock like cheap sugar into clean-burning ethanol fuel that emits far less greenhouse gases into the atmosphere than oil-based gasoline. It’s designed to be installed in household driveways and the parking lots of small businesses. This is a revolutionary eco-product. Ethanol has been around for decades, but the MicroFueler lets people make it themselves — safely and for a lot less than they would pay for petroleum-based fuels at their local service station. A gallon of ethanol from this home-based pump costs about 50 cents plus the cost of the feedstock, which can include waste sugar, beer and wine. With the right, cheap ingredients, users can get close to $1 per gallon of fuel. Inside, the MicroFueler features a system that mixes yeast and water with the feedstock, which is preheated with two Standard Xchange heat exchangers to make the distilling or “brewing” process possible. 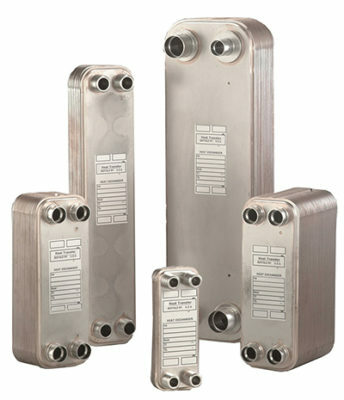 The Standard Xchange components were selected personally by the MicroFueler’s founder, Floyd Butterfield. The MicroFueler is not a pipe — or pump — dream. Several years ago, Silicon Valley entrepreneur Thomas Quinn, who invented the motion sensor technology for Nintendo’s Wii gaming system, believed he could bring fuel production to individuals. He found Butterfield to help him do that, and E-Fuel was born. With Quinn’s sense of what makes a winning product, the MicroFueler was made small, light and smart — with an internal Internet connection that remotely monitors the product performance and automatically “phones home” when the pump needs service attention. With Quinn’s financial backing, this new pump has moved into limited production and has solid, global growth aspirations. Last year, California Governor Arnold Schwarzenegger held a press conference to credit the MicroFueler for ushering in the “dawn of the organic fuel era.” Even the waste produced by the MicroFueler is “green” — a slurry that can be reused as fertilizer. And just recently, the government of India expressed interest in hundreds of thousands of MicroFuelers to help homeowners in remote areas produce their own cooking fuel.